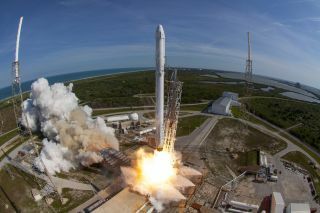 A SpaceX Falcon 9 rocket and Dragon spacecraft lift off from Space Launch Complex 40 at the Cape Canaveral Air Force Station in April 8, 2016 in Florida in this file photo. SpaceX will launch its next Dragon cargo mission for NASA from the pad on Dec. 11, 2017 using a reused Falcon 9 booster. SpaceX is about to take a big step in its quest for full reusability. The company's two-stage Falcon 9 rocket is scheduled to launch a robotic Dragon capsule tomorrow (Dec. 12) on a resupply mission to the International Space Station (ISS) for NASA. The liftoff will be the second for this particular Dragon and Falcon 9 first stage, which launched on ISS cargo runs in April 2015 and June 2017, respectively. "In the long run, reusability is going to significantly reduce the cost of access to space, and that's what's going to be required to send future generations to explore the universe," Jensen added. "We want to be able to send thousands of people into space, not just tens." SpaceX has landed Falcon 9 first stages 19 times during orbital flights to date, and it has re-flown such boosters on three separate occasions. It has re-launched a used Dragon just the one time noted above. Tomorrow's launch will therefore be SpaceX's first reusability double-dip, with both booster and spacecraft. NASA officials said they're not nervous about tomorrow's launch — well, not any more nervous than usual, anyway. "Every time we launch a rocket, I'm anxious," said Kirk Shireman, NASA's ISS program manager. "It's still a dangerous business, so I will be anxious tomorrow." But NASA has a lot of experience with used spacecraft, Shireman said, pointing to the agency's now-retired space shuttle orbiters. He also said NASA did "an extensive review" to assess the risk of using a pre-flown Falcon 9 first stage. "We're very comfortable that the risk posture on this vehicle is not significantly greater than [on] a new booster," Shireman said. "We think of it as equivalent risk." SpaceX's ultimate goal is total reusability, as the company's recently unveiled plans for its huge Mars rocket and spaceship make clear. But the Falcon 9's second stage remains expendable for now, and for the near future. "That is not a priority right now," Jensen said of working to make the second stage reusable. Tomorrow's Dragon launch is noteworthy in other respects as well. For example, the Dragon is loaded with lots of interesting science gear, including a privately owned machine designed to make optical fiber on orbit, a space-debris tracker and an instrument that will precisely measure the amount of solar energy reaching Earth. In all, Dragon will tote about 4,800 lbs. (2,180 kilograms) of payload up to the orbiting lab. Also, the liftoff will take place from the newly refurbished Launch Complex 40 at Florida's Cape Canaveral Air Force Station. The launch will be the first in more than a year from Pad 40, which was seriously damaged in September 2016 when a Falcon 9 exploded during a routine pre-flight test.